The news around the upcoming film Fantastic Beasts and Where to Find Them continues to roll in. 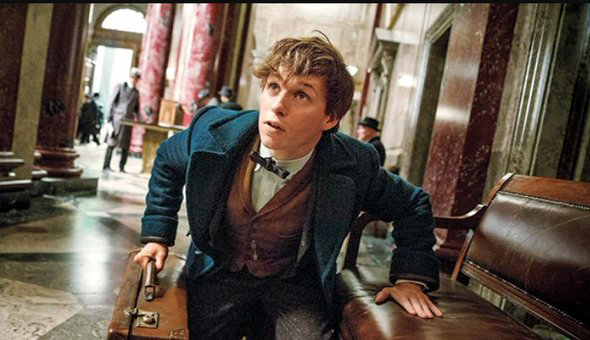 Last month, the teaser trailer was revealed, along with some pics of Eddie Redmayne as Newt Scamander. This week Matthew Lewis, AKA Neville Longbottom, visited set and gave the project two giant thumbs up. And now, we have this fun tidbit from producer David Heyman: Originally, he considered making the film a documentary. Heyman, who is producing Fantastic Beasts, was also a producer on the Harry Potter films. In fact, he scored the movie rights to the first film in 1997, before the first book was even published. So it’s safe to say he’s been a part of the Harry Potter world since the beginning, and has been working closely with J.K. Rowling for almost 20 years. Tonight, Heyman will be honored at the Producers Guild Award with the David O. Selznick Achievement Award. Besides his work on Harry Potter, he’s found success with the Paddington movies and with the much-awarded Gravity, a collaboration with Prisoner of Azkaban director Alfonso Cuarón. Fantastic Beasts doesn’t come out until November, but we’re already wondering: Will there be a sequel? Multiple films? We can’t help but wonder! Luckily, Heyman has an answer—kind of. And for the record, we wouldn’t be opposed to seeing a Fantastic Beasts film AND documentary. Just putting that out there.